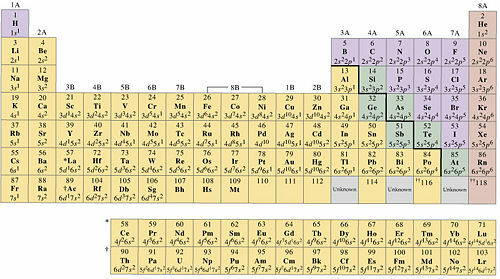 In common terminology, transition metals (or transition elements) are chemical elements that lie in groups 3 through 12 of the periodic table, in the standard view of the table. The name transition comes from their position in the table—they form a transition between the main group elements, which occur in groups 1 and 2 on the left side, and groups 13–18 on the right. Some transition elements occur naturally in their metallic state and have been known since antiquity. Three of these—gold, silver, and copper—have been used extensively in coinage and jewelry. The use of copper in tools was one of the first historical technological advances. Also, iron, in the form of steel, is used in many structures, from automobiles to bridges. Many transition metals are useful as catalysts in industrial and laboratory settings, and many of these elements form brightly colored compounds. Placement of the group of transition elements in the periodic table can be observed by examining the color-coded table shown below. The general definition of transition metals as those that lie in groups 3 through 12 of the periodic table, mentioned above, is simple and has been traditionally used. Although this definition is still widely used, the characteristic properties of transition metals arise because of the electron configuration of their atoms, which have partially filled "d orbitals." Based on this perspective, the term transition element has been defined more strictly. The International Union of Pure and Applied Chemistry (IUPAC) defines a transition element as "an element whose atom has an incomplete d sub-shell, or which can give rise to cations with an incomplete d sub-shell." By this definition, zinc, cadmium, and mercury (group 12 elements) are not considered transition metals. This is because the atoms of these elements and their stable ions contain electrons that completely fill the d orbitals. When these elements form ions, they usually lose electrons from only their outermost s subshell, leaving the d subshell intact. In just a few, exceptional cases, they have formed unstable ions in which the d subshell is partly filled. Element 112 (in group 12) may also be excluded, because its electron configuration is likely to be similar to that of other members of group 12, and its oxidation properties are unlikely to be observed due to its radioactive nature. Thus, this stricter definition of transition metals limits the term to elements in groups 3 to 11. Almost all of them are solids at room temperature, with high tensile strength (ability to withstand stress), density, and melting and boiling points. The one exception is mercury, which is a liquid. Most of them are silvery-blue at room temperature. The exceptions are copper and gold. They form monatomic ions with a 2+ charge, but can form other ions with a different charge. For example, iron can form Fe2+ and Fe3+ ions. In addition, they often have higher oxidation states in compounds. They form complexes known as "coordination compounds," many of which are brightly colored. They are often good catalysts. For example, iron is the catalyst for the Haber process, involving the reaction of nitrogen and hydrogen to produce ammonia. Nickel, palladium, or platinum can be used in the hydrogenation of (addition of hydrogen atoms to) alkenes and alkynes. Platinum is the catalyst in the catalytic converters of automobile exhaust systems. In addition to these common characteristics, there are some trends in properties as we go through a period, much like those in the main group elements, but with less dramatic changes. Going across the transition metals of a period, the atomic radius generally tends to decrease, and the first ionization energy (energy required to remove an electron from the neutral atom) increases. Also, as we go across the period, the metals tend to become softer, and mercury is a liquid at room temperature. Group 11 elements (copper, silver, and gold) are particularly unreactive. These "noble" metals can occur naturally in their elemental metallic state, and they are sometimes known as coinage metals as they have been useful for minting coins. The properties of transition metals arise from their defining characteristic of partially filled d orbitals. They are metals because the d orbital electrons are delocalized within the metal lattice, forming metallic bonds. Most transition metals have two electrons in their outermost, s subshell. As we consider these elements across a period, the number of d electrons increases by one. Thus, in the fourth period, scandium (Sc, group 3) has the configuration [Ar]4s23d1, and the next element Titanium (Ti, group 4) has the configuration [Ar]4s23d2, and so forth. There are, however, some exceptions to this progression. For instance, in the fourth period, copper has the configuration ([Ar]4s13d10) and chromium is ([Ar]4s13d5). These exceptions occur because the atoms acquire additional stability when their subshells are half-filled or fully filled. Copper has a completely filled d subshell, and chromium has a half-filled d subshell. Similar exceptions are more prevalent in the fifth, sixth, and seventh periods. When these metals lose electrons to form monatomic ions, they generally lose their s electrons first. Thus, most transition metals form ions with a 2+ charge. Higher oxidation states involve d electrons as well. Monatomic ions with a charge greater than 3+ are rare, and the higher oxidation states of transition metals occur in compounds with highly electronegative elements such as oxygen. This variability of oxidation state is because the atoms of transition elements can lose or share d electrons without a high energetic penalty. The atom of manganese, for example, has two 4s electrons and five 3d electrons, which can be removed or shared with other atoms. Loss or sharing of all of these electrons leads to a 7+ oxidation state. Osmium and ruthenium compounds are commonly isolated in stable 8+ oxidation states, which is among the highest for isolable compounds. This table shows some of the oxidation states found in compounds of the transition metals. A solid circle represents a common oxidation state, and a ring represents a less common (energetically less favorable) oxidation state. The number of oxidation states of each element increases up to manganese (group 7), after which they decrease. Later transition metals have a stronger attraction between protons and electrons (because there are more of them present), requiring more energy to remove the electrons. When these elements are in lower oxidation states, they can be found as simple ions. In their higher oxidation states, these elements are usually bonded covalently to electronegative elements like oxygen or fluorine, forming polyatomic ions such as chromate, vanadate, or permanganate. Ions in higher oxidation states tend to make good oxidizing agents, whereas elements in low oxidation states become reducing agents. Going across a period, the 2+ ions start as strong reducing agents and increase in stability. Conversely, the 3+ ions start at higher stability and become more oxidizing across the period. As noted above, the chemistry of transition metals is characterized by the partially filled d orbitals allowing for multiple oxidation states. Another consequence of their electron configuration is that these elements can form stable complexes, or coordination compounds. In such a complex, the transition metal atom or ion forms weak covalent bonds to other small molecules or ions known as "ligands." In some cases, the oxidation state of the transition metal may be zero or a negative number. Transition metal compounds are often highly colored and coordination by ligands plays a large part in determining the compound's color. In the absence of ligands, the d orbitals of an atom all have the same energy, but when surrounded by ligands, the energies of the d orbitals change and are no longer equal. This phenomenon is described by the cystal field theory. For many compounds of this type, the resulting difference in energy of the d orbitals is in the energy range of visible light. As a result, they strongly absorb particular wavelengths of visible light and appear vividly colored. Many different colors can be observed, and the color can vary even between different ions of the same element. A striking example is the different ions of vanadium (V): VO2+ is yellow in solution, VO2+ is blue, V3+(aq) is green and V2+(aq) is purple. Interestingly, though zinc can form complexes, they are colorless because the 3d orbitals of zinc are completely filled. The full d orbitals prevent the complex from absorbing visible light when the energies of the d orbitals are altered by ligands. As zinc is in group 12, it is not considered a transition metal by the newer IUPAC definition. ↑ transition element. IUPAC Gold Book. Retrieved January 9, 2009. ↑ Cotton, F. Albert, G. Wilkinson, C.A. Murillo, and M. Bochmann. 1999. Advanced Inorganic Chemistry, 6th ed. New York: Wiley. ISBN 0471199575. This page was last modified on 15 December 2015, at 22:48.